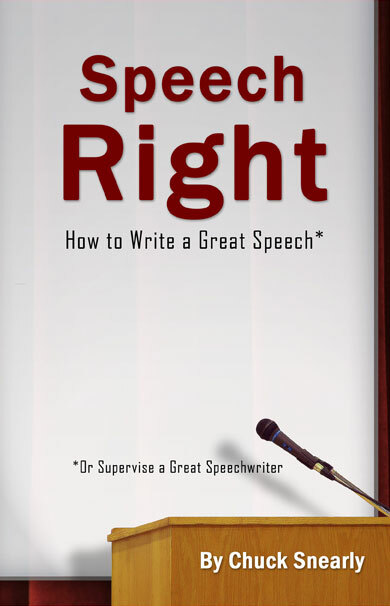 Speech Right, Inc. specializes in executive communication, and can help you write your next great speech! We have more than thirty-five years of communications and speechwriting experience. Our clients have included top executives at some of the largest and most successful companies in the world, including Ford Motor Company, Royal Dutch Shell, Dean Foods, and Robert Bosch GmBh. We invite you to look around our Web site to learn more about who we are and what we do. For more information, or to have us write a great speech for you, please contact us here. If you have to write a speech and aren’t quite sure how to go about it, you have come to the right place. “Speech Right” is intended for people who volunteered—or were drafted—to write a speech for themselves, their boss, their professor, their client, or anyone else who has been called on to stand and deliver in front of an audience. In addition to beginners, it also will be useful—or at least mildly amusing and cathartic—for seasoned professionals. Whatever your current skill level, “Speech Right” will help you write the speech right.